Not to be confused with Trolling (fishing). Trawling is a method of fishing that involves pulling a fishing net through the water behind one or more boats. The net that is used for trawling is called a trawl. The boats that are used for trawling are called trawlers or draggers. Trawlers vary in size from small open boats with as little as 30 hp (22 kW) engines to large factory trawlers with over 10,000 hp (7.5 MW). Trawling can be carried out by one trawler or by two trawlers fishing cooperatively (pair trawling). Trawling can be contrasted with trolling, where baited fishing lines instead of trawls are drawn through the water. Trolling is used both for recreational and commercial fishing whereas trawling is used mainly for commercial fishing. Trawling is also commonly used as a scientific sampling, or survey, method. 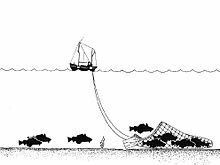 Trawling can be divided into bottom trawling and midwater trawling, depending on how high the trawl (net) is in the water column. Bottom trawling is towing the trawl along (benthic trawling) or close to (demersal trawling) the sea floor. Midwater trawling is towing the trawl through free water above the bottom of the ocean or benthic zone. Midwater trawling is also known as pelagic trawling. Midwater trawling catches pelagic fish such as anchovies, shrimp, tuna and mackerel, whereas bottom trawling targets both bottom-living fish (groundfish) and semi-pelagic fish such as cod, halibut and rockfish. The gear itself can vary a great deal. Pelagic trawls are typically much larger than bottom trawls, with very large mesh openings in the net, little or no ground gear, and little or no chaffing gear. Additionally, pelagic trawl doors have different shapes than bottom trawl doors, although doors that can be used with both nets do exist. When two boats are used (pair trawling), the horizontal spread of the net is provided by the boats, with one or in the case of pelagic trawling two warps attached to each boat. However, single-boat trawling is more common. Here, the horizontal spread of the net is provided by trawl doors (also known as "otter boards"). Trawl doors are available in various sizes and shapes and may be specialized to keep in contact with the sea bottom (bottom trawling) or to remain elevated in the water. In all cases, doors essentially act as wings, using a hydrodynamic shape to provide horizontal spread. As with all wings, the towing vessel must go at a certain speed for the doors to remain standing and functional. This speed varies, but is generally in the range of 2.5–4.0 knots. The vertical opening of a trawl net is created using flotation on the upper edge ("floatline") and weight on the lower edge ("footrope") of the net mouth. The configuration of the footrope varies based on the expected bottom shape. The more uneven the bottom, the more robust the footrope configuration must be to prevent net damage. This is used to catch shrimp, shellfish, cod, scallops and many others. Trawls are funnel-shaped nets that have a closed-off tail where the fish are collected and is open on the top end as the mouth. Trawl nets can also be modified, such as changing mesh size, to help with marine research of ocean bottoms. Although trawling today is heavily regulated in some nations, it remains the target of many protests by environmentalists. Environmental concerns related to trawling refer to two areas: the lack of selectivity and the physical damage which the trawl does to the seabed. Since the practice of trawling started (around the 15th century), there have been concerns over trawling's lack of selectivity. Trawls may be non-selective, sweeping both marketable and undesirable fish and fish of both legal and illegal size. Any part of the catch which cannot be used is considered by-catch, some of which is killed accidentally by the trawling process. By-catch commonly includes valued species such as dolphins, sea turtles, and sharks, and may also include sublegal or immature individuals of the targeted species. Many studies have documented large volumes of by-catch that are discarded. For example, researchers conducting a three-year study in the Clarence River found that an estimated 177 tons of by-catch (including 77 different species) were discarded each year. Size selectivity is controlled by the mesh size of the "cod-end"—the part of the trawl where fish are retained. Fishermen complain that mesh sizes which allow undersized fish to escape also allow some legally catchable fish to escape. There are a number of "fixes", such as tying a rope around the "cod-end" to prevent the mesh from opening fully, which have been developed to work around technical regulation of size selectivity. One problem is when the mesh gets pulled into narrow diamond shapes (rhombuses) instead of squares. The capture of undesirable species is a recognized problem with all fishing methods and unites environmentalists, who do not want to see fish killed needlessly, and fishermen, who do not want to waste their time sorting marketable fish from their catch. A number of methods to minimize this have been developed for use in trawling. Bycatch reduction grids or square mesh panels of net can be fitted to parts of the trawl, allowing certain species to escape while retaining others. Studies have suggested that shrimp trawling is responsible for the highest rate of by-catch. Trawling is controversial because of its environmental impacts. Because bottom trawling involves towing heavy fishing gear over the seabed, it can cause large-scale destruction on the ocean bottom, including coral shattering, damage to habitats and removal of seaweed. The primary sources of impact are the doors, which can weigh several tonnes and create furrows if dragged along the bottom, and the footrope configuration, which usually remains in contact with the bottom across the entire lower edge of the net. Depending on the configuration, the footrope may turn over large rocks or boulders, possibly dragging them along with the net, disturb or damage sessile organisms or rework and re-suspend bottom sediments. These impacts result in decreases in species diversity and ecological changes towards more opportunistic organisms. The destruction has been likened to clear-cutting in forests. The primary dispute over trawling concerns the magnitude and duration of these impacts. Opponents argue that they are widespread, intense and long-lasting. Defenders maintain that impact is mostly limited and of low intensity compared to natural events. However, most areas with significant natural sea bottom disturbance events are in relatively shallow water. In mid to deep waters, bottoms trawlers are the only significant area-wide events. Bottom trawling on soft bottoms also stirs up bottom sediments and loading suspended solids into the water column. One bottom trawler can put more than 10 times the amount of suspended solids pollution per hour into the water column than all the suspended solids pollution from all the sewerage, industrial, river and dredge disposal operations in Southern California combined. These turbidity plumes can be seen on Google Earth in areas where they have high resolution offshore photos (see Bottom trawling). When the turbidity plumes from bottom trawlers are below a thermocline, the surface may not be impacted, but less visible impacts can still occur, such as persistent organic pollutant transfer into the pelagic food chain. As a result of these processes, a vast array of species are threatened around the world. In particular, trawling can directly kill coral reefs by breaking them up and burying them in sediments. In addition, trawling can kill corals indirectly by wounding coral tissue, leaving the reefs vulnerable to infection. The net effect of fishing practices on global coral reef populations is suggested by many scientists to be alarmingly high. Published research has shown that benthic trawling destroys the cold-water coral Lophelia pertusa, an important habitat for many deep-sea organisms. Midwater (pelagic) trawling is a much "cleaner" method of fishing, in that the catch usually consists of just one species and does not physically damage the sea bottom. However, environmental groups have raised concerns that this fishing practice may be responsible for significant volumes of by-catch, particularly cetaceans (dolphins, porpoises, and whales). In light of the environmental concerns surrounding trawling, many governments have debated policies that would regulate the practice. 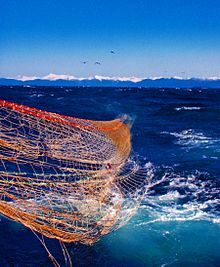 The word "trawling" has come to be used in a number of non-fishing contexts, usually meaning indiscriminate collection with the intent of picking out the useful bits. For instance, in law enforcement it may refer to collecting large volumes of telephone call records hoping to find calls made by suspects. It also occurs frequently in reference to research methods, where it means searching through written sources for relevant information. ^ "Not found". Mass.gov. Archived from the original on 2018-04-17. ^ Liggins, G.W., Kennelly, S.J., 1996. By-catch from prawn trawling in the Clarence River estuary, New South Wales, Australia. Fish. Res. 25, 347-367. ^ Alverson D L, Freeberg M K, Murawski S A and Pope J G. (1994) A global assessment of fisheries bycatch and discards. FAO Fisheries Technical Paper No 339 Rome, FAO 1994. ^ Weaver, Dallas E (2007). "'Remote Impacts of Bottom Trawling". Archived from the original on 2009-04-10. ^ Roberts S, Hirshfield M. (2004) Deep Sea Corals: Out of Sight, But No Longer Out of Mind Archived 2009-02-26 at the Wayback Machine. Oceania. In Frontiers in Ecology and the Environment, April 2004. ^ Fossa J H, Mortensen P B and Furevik D M. (2002) The deep water coral Lophelia pertusa in Norwegian waters: distribution and fishery impacts Archived 2009-02-26 at the Wayback Machine. Hydrobiologia 471: 1-12, 2002. ^ Ross A, Isaac S. (2004) The net effect? A review of cetacean bycatch in pelagic trawls and other fisheries in the north-east Atlantic. London, UK: Greenpeace Environmental Trust. Wikimedia Commons has media related to Trawling. Known Trawling Grounds of the World (2000) World Resources Institute.